This universal mounting kit consists of the RAM POD I universal No-Drill™ vehicle base, 18”/457mm rigid aluminum rod, single 1" or 1.5" ball socket arm and round base adaptor. Base of the mount connects to seat rail without any drilling necessary. 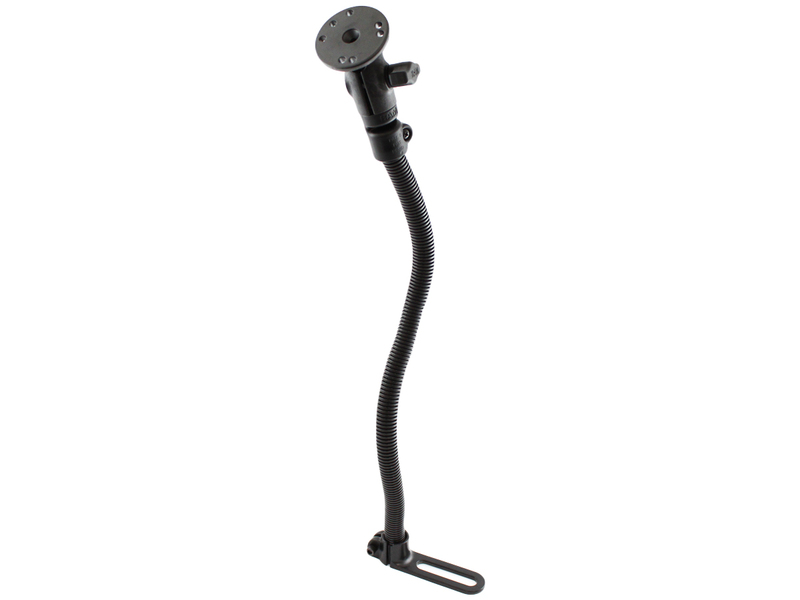 The 18" rigid aluminum rod can be bent to position your device to its optimum viewing position. The 2.5" diameter round base adaptor contains the universal AMPS hole pattern. Installation Instructions: At right angles to the base of the 18" long leg is a foot with a mounting hole. Simply place the hole into the passenger seat mounting bolt and adjust the mount to the required height with the rigid aluminum rod.